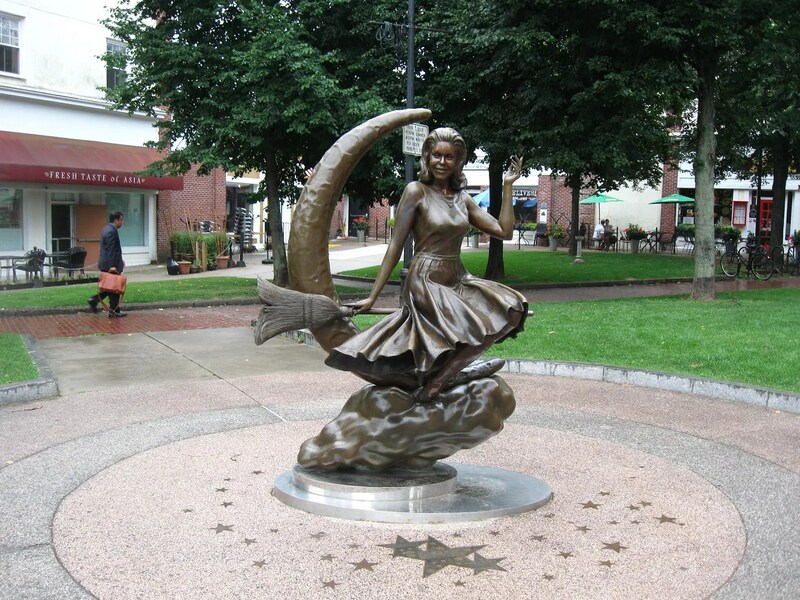 2013 Road Trip Photos #21: Salem, Part 2 of 2: All the Quote-Unquote “Witches” « Midlife Crisis Crossover! 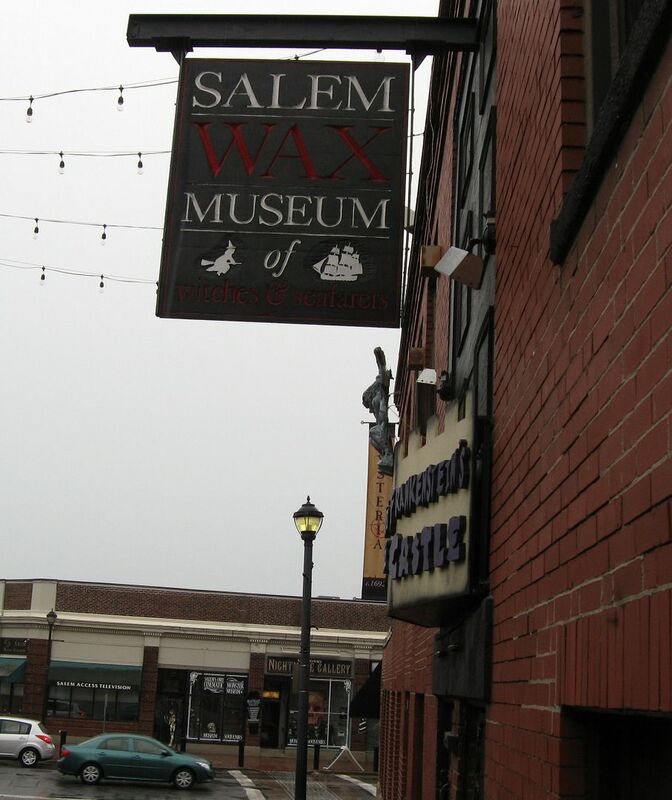 Day Six…we drove northeast through a maze of highways and disorganized side streets to world-famous Salem, listed in our American history books as a site known for famous trials of considerable controversy. 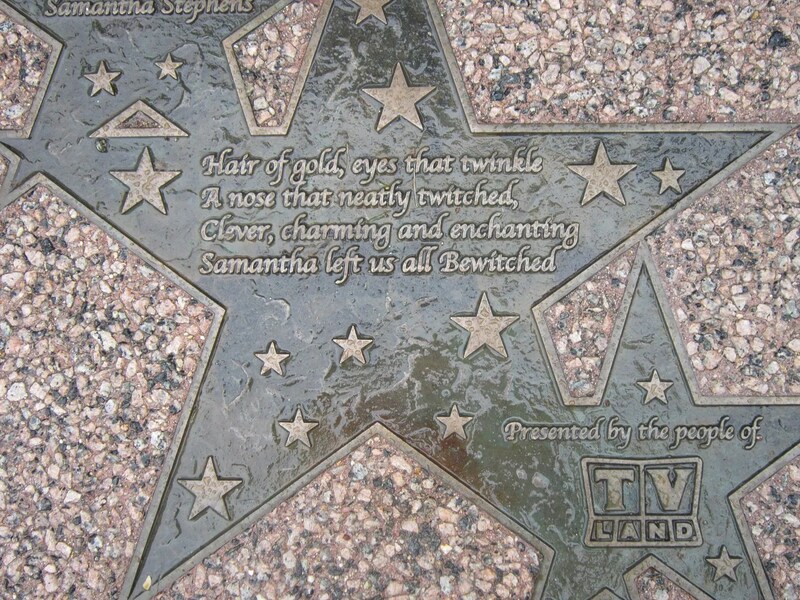 The town’s official tourism literature swears there’s more to Salem than just witches. During our research I got the impression that certain local parties were sick and tired of the whole “witch” debacle and wanted to put it behind them forever. 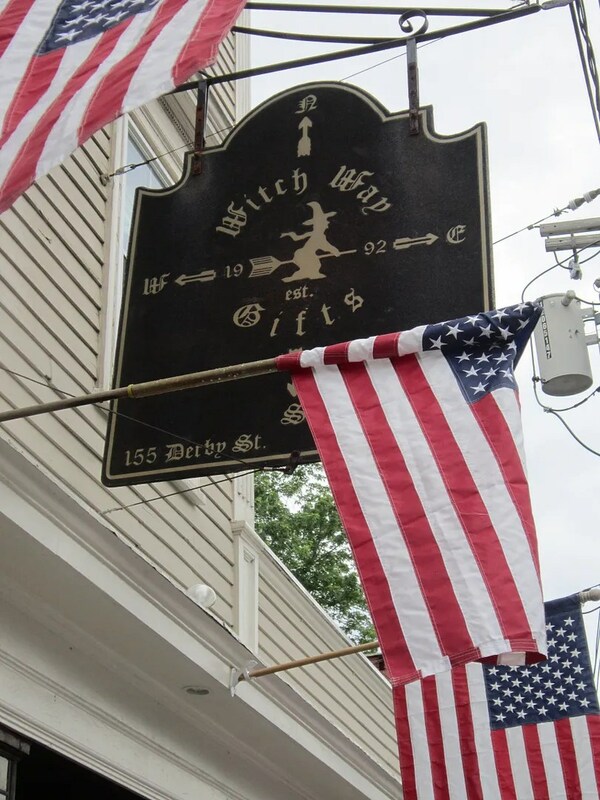 One of the most famous witches in TV history is a fun sight for us tourists, but its 2005 installation was no small cause for concern among citizens who aren’t as quick to trivialize their town’s dark legacy. To outsiders without that burden, it’s whimsical TV tourism fun, with all the carefully reenacted taste and verisimilitude we’ve come to expect from ’60s sitcoms. 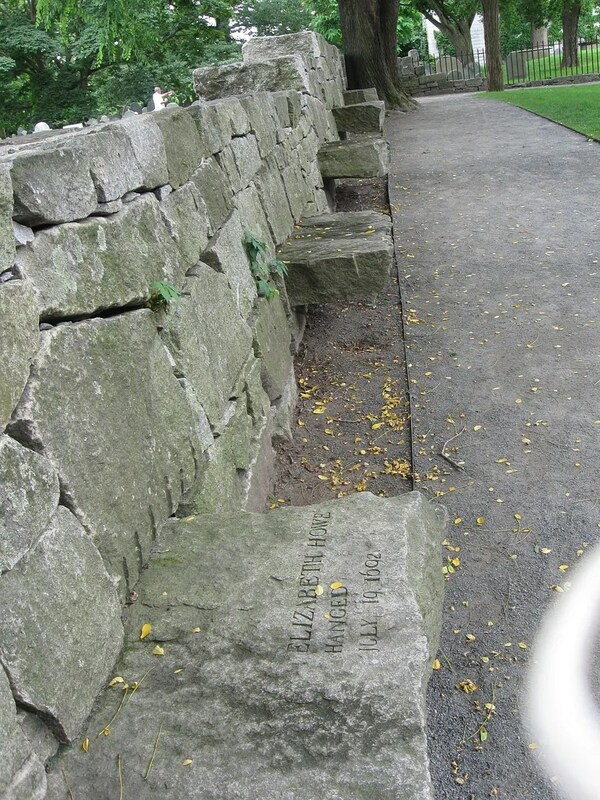 If you prefer somber tributes to what transpired here in far-off 1692 (Columbus’ bicentennial), the Salem Witch Trials Memorial was established in 1992 (the debacle’s tricentennial) as a grassy courtyard surrounded by twenty stone benches, one for each of the unjustly convicted. The benches confirm nineteen of the twenty were hanged. 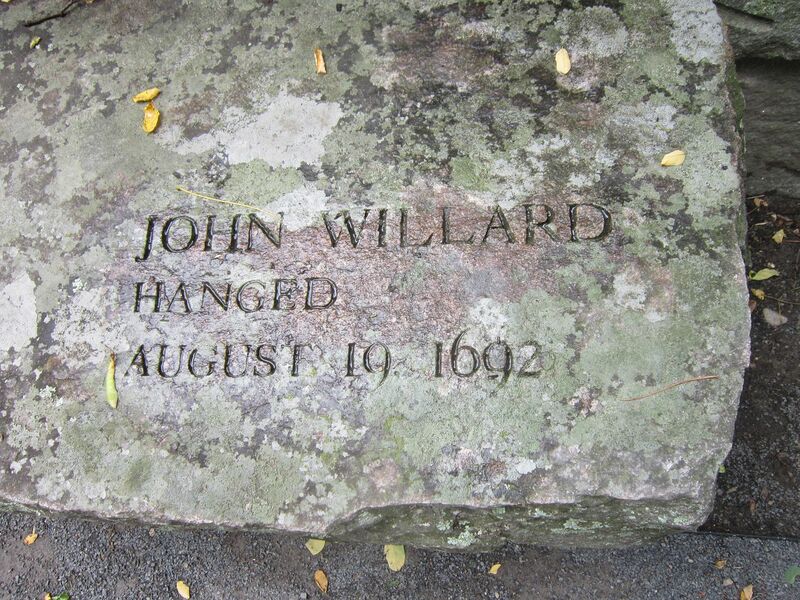 The twentieth, a farmer named Giles Corey, was “pressed to death” by having stones piled atop him. Since none of the twenty were allowed a dignified burial — relegated instead to anonymous shallow graves — this is the closest thing to proper gravesites that any of them ever received. Etched into the courtyard’s threshold are actual quotes from some of the accused, commemorating their ignored pleas of innocence. In all honesty, this was one of the most contemplatively disturbing sights of our entire vacation. The red line on the lower right is a segment of the Salem Heritage Trail. 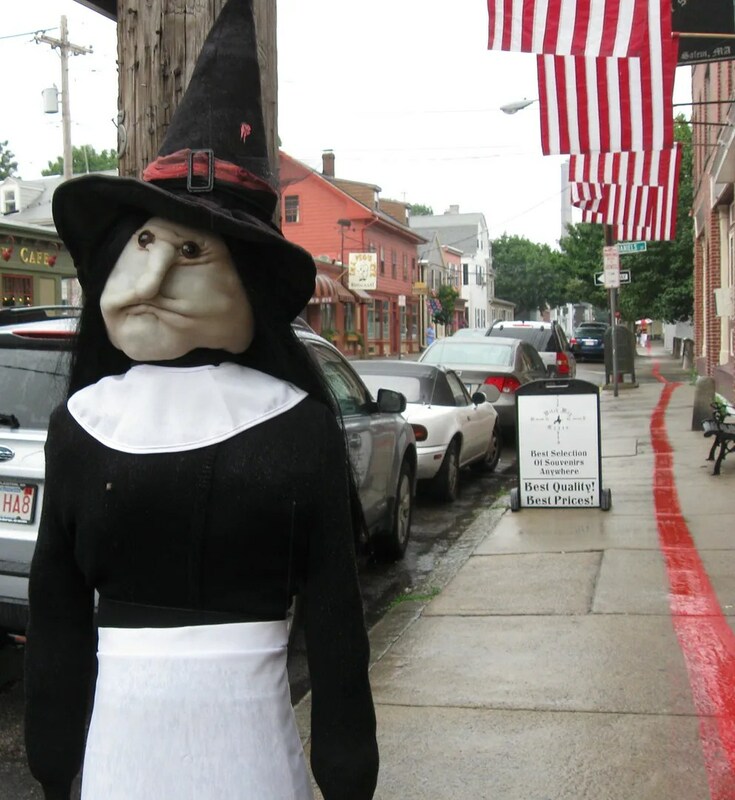 Much like Boston’s Freedom Trail, following this painted red line around town will take you near all the major attractions, along with a few minor ones such as this stuffed pilgrim witch (I’m, uh, not really sure how that works) and numerous American flags that hadn’t yet been taken down after the July 4th holiday. 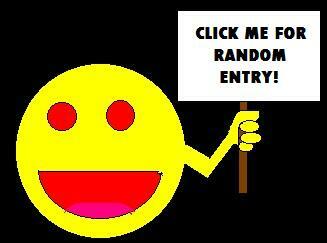 Then again, perhaps I’m wrong and those flags are kept up year-round as a counterbalance to all the witchcraft. 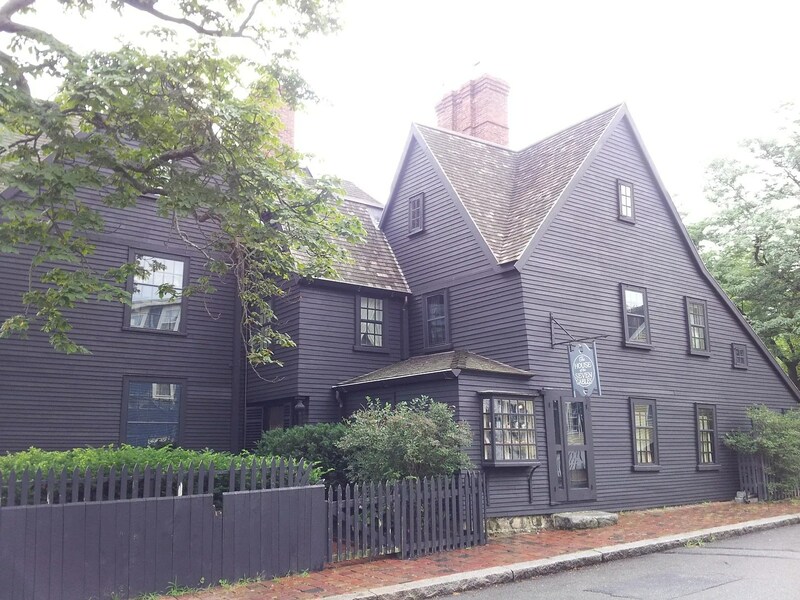 One of the largest stops along the way is the House of the Seven Gables, star of the eponymous Nathaniel Hawthorne novel about the power of witches and corrupted family legacies. I brought an old Goodwill copy of the book along with me for summer reading, but was only thirty pages into it by Day Six. It was slow going at first, and I found myself rather irritated during the later chapters where the narrator spends a few dozen pages mocking a defenseless dead body. 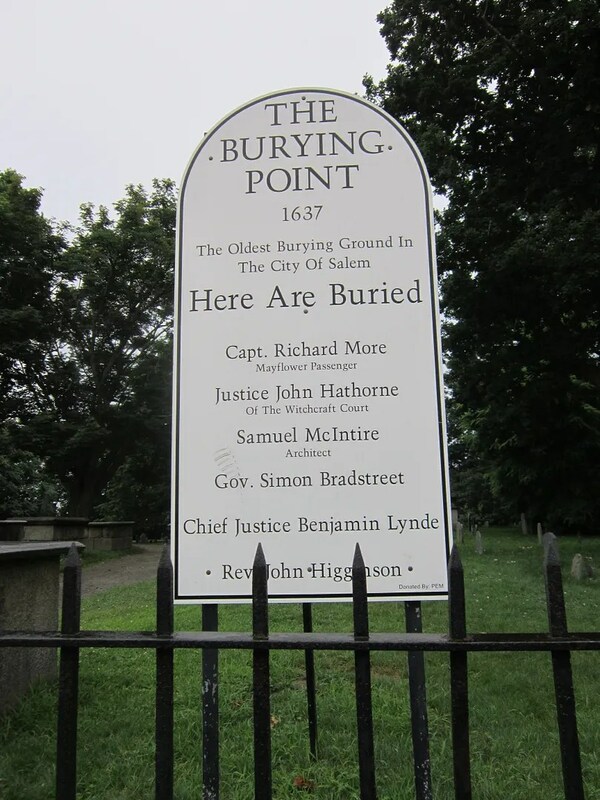 If you prefer to return to the realm of the dead, the Burying Point contains a few notable personalities, including the only Pilgrim ever to move from Plymouth to Salem. You’ll also note one of the Salem Witch Trial judges received a decent plot, unlike those whose who were executed under his watch. True story: Judge Hathorne was an ancestor of Nathaniel Hawthorne, who added the “w” to his own name to obscure the connection. 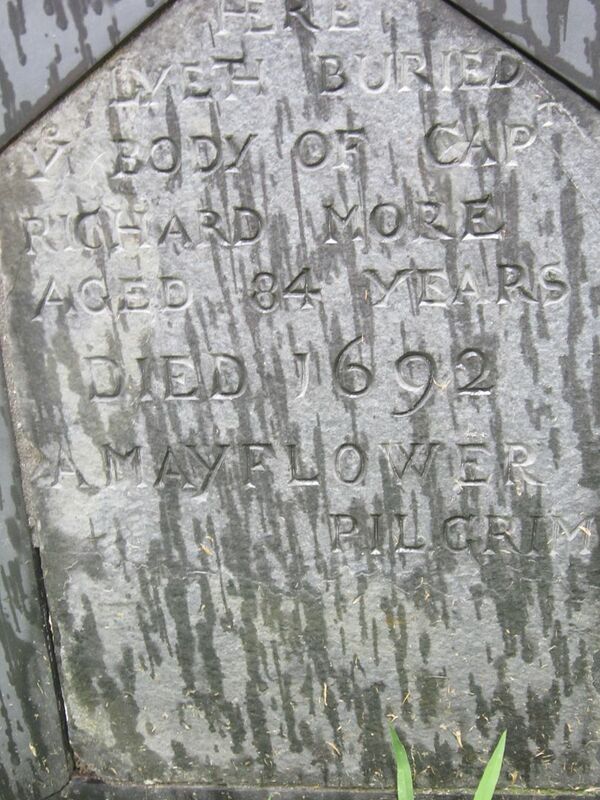 Exhibit A: the final resting place of official Pilgrim Captain Richard More. 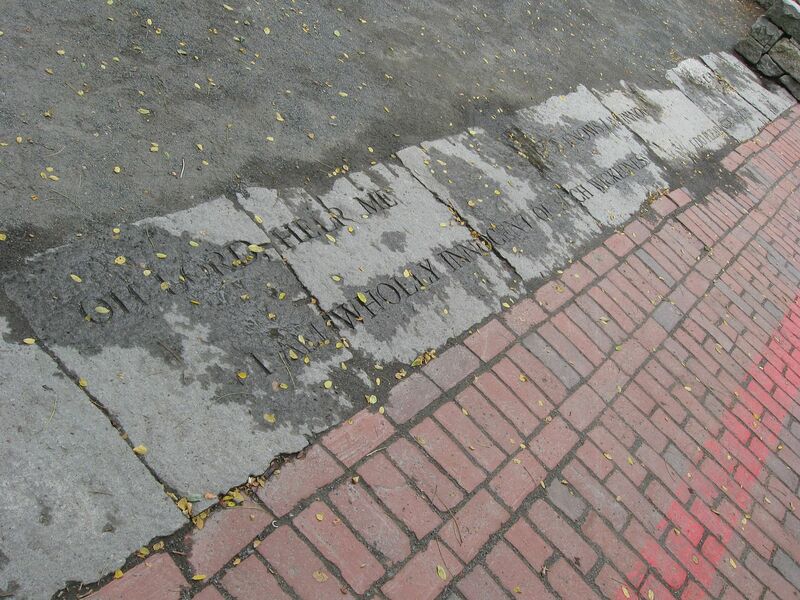 His dates and epitaph are dampened by the rains that dogged us all through our self-guided walkabout. Or if you prefer your historical sightseeing a little less morose (or, if you will, “a little less grave”), several museums dot the cityscape in varying sizes and sensibilities. Serious fans of the Craft can stop at Witch Way Gifts for artifacts, props, paraphernalia and accessories. My wife’s primary objective was their smashed penny machine, her vacation souvenir of choice wherever possible. While she mutilated unwanted American currency to her heart’s content, my son had the chance to browse their fixtures full of things he’d never seen before — spellbooks, Ouija boards, tarot decks, and wands outside the Harry Potter universe. The place reminded of the Treasures section in my old Dungeon Masters Guide. 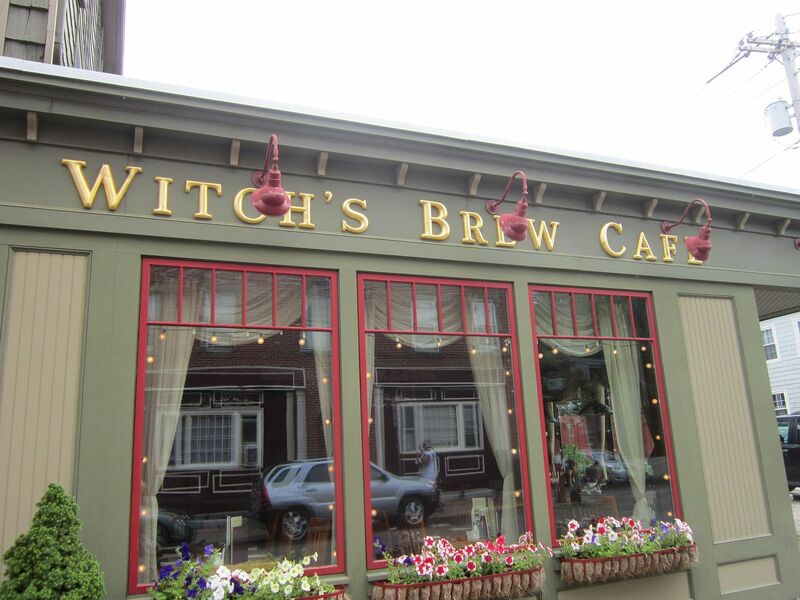 Our final Massachusetts lunch was at the Witch’s Brew Cafe. While their menu wasn’t exactly specialized, it wasn’t until this meal that I finally realized I hadn’t had a single bite of New England clam chowder in its native habitat. This may not have been the greatest place to check that minor box on my to-do list, but it sufficed. Not bad. « “Sleepy Hollow” 12/9/2013 (spoilers): What Ever Happened to Baby Crane?